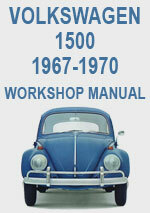 This workshop repair manual is for the following Volkswagen models made between 1966-1970. No more greasy Workshop Manuals! Just print off the pages you need and start fixing your Volkswagen. This Repair Manual is in printable 'pdf' format. To learn more about downloading this file or to download Adobe pdf reader free please go to our Download Help page. Volkswagen 1500 Workshop Service Repair Manual $9.99 Immediate Download!